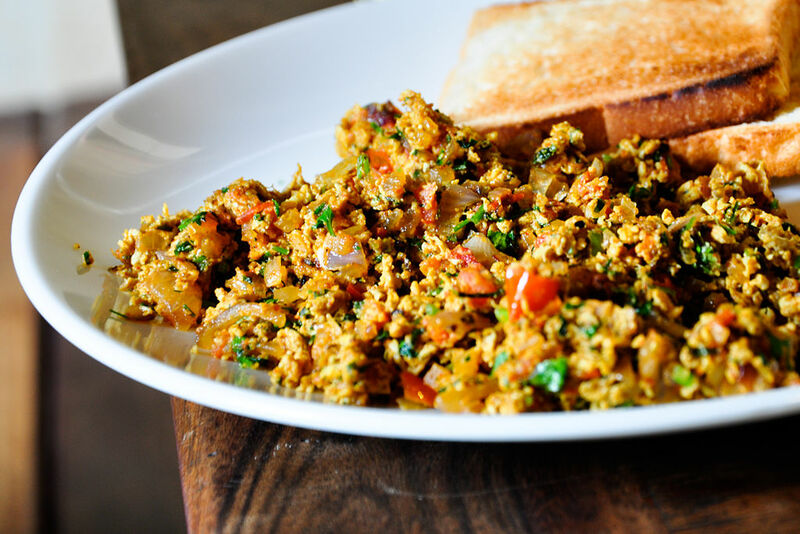 Anda Bhurji – Spicy scrambled eggs the indian way. This can be used to eat with pav, toasts, naan, paratha or as a filling for pita or can be used to make a wrap with tortilla. Whisk the four eggs gently with a spoon and keep aside. Take a pan, add oil or ghee to it. Now add jeera, onions, hing, green chillies, curry leaves, capsicum and ginger to it. Saute. Add tomatoes and few coriander leaves. Saute for 2 minutes. Add 1 Tbsp butter, pav bhaji masala, red chilli powder, turmeric powder and salt as per taste. Lastly add slightly beaten eggs and keep whisking them until cooked. Remember, Anda Bhurji is typically cooked till the eggs are well done and it is dry, unlike the American scrambled eggs which are wet and creamy. Top it up with butter. Garnish with the rest of coriander leaves. Serve hot with buttered pav or toast or plain paratha. Egg bhurji or egg khagina (as it is known in Pakistan) or Anda Bhurji, is a dish popular in north and western India and Pakistan. It is often confused with scrambled eggs and the Parsi dish akuri but Egg Bhurji is a different dish in totality. The difference lies in its preparation and addition of sautéed chopped onions, chilies, and optional spices. Made this many times now, really delicious, thanks for sharing!